I like to think I have tried a lot of different foods in my day, but I had never once tried collard greens. In fact, I had never even seen them before! So when they were at my local farm, I just HAD to pick some up! I did so with absolutely no idea how to cook them, but I knew I'd find a way. My daughter, who loves sautéed swiss chard, was very excited to try these. It is basically the same concept - cook the greens until they are wilted to make them less bitter. These, however, are simmered in vegetable broth to reach the desired texture. The collard greens were quite tasty, but my daughter thought they were a little spicy. I would suggest eliminating the red pepper flakes if serving to young children. This is a simple recipe that is a nice change of pace. It's always such fun to try something new! Saute the onions until slightly softened, about 2 minutes. Add the garlic and red pepper flakes, cook another minute. Add the collard greens and cook another minute. Add the vegetable stock, bring to a boil, then simmer for 30-40 minutes until the greens are tender. Add the tomatoes, salt, and pepper. 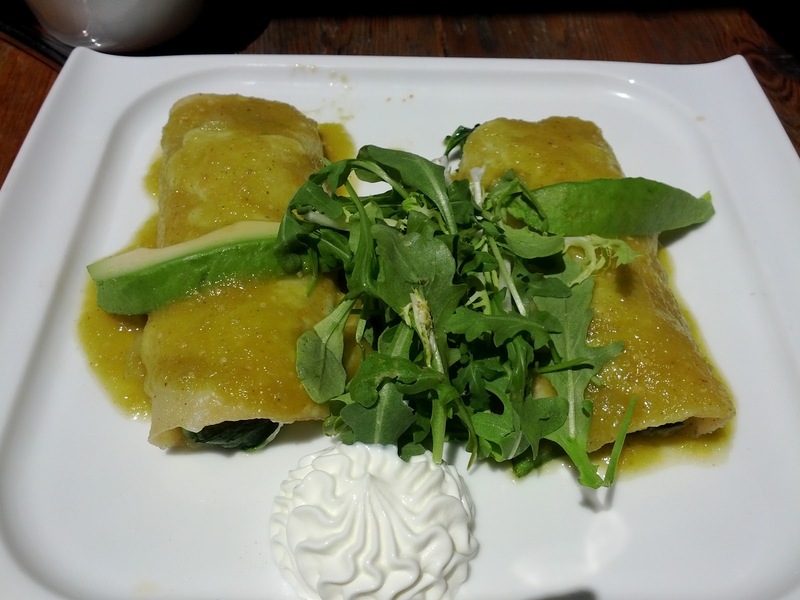 As a vegetarian, I often find myself underwhelmed at Mexican restaurants. There are usually very few options, and they only involve some heavy cheese dish. Even bean burritos are often not an option because many restaurants still use lard to cook their refried pinto beans. 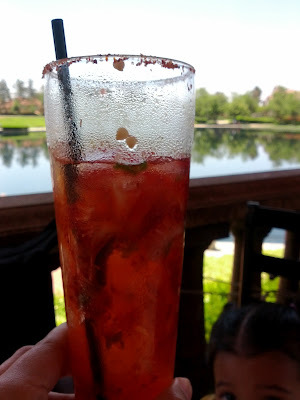 So when my husband decided to try Carmelita's in Rancho Santa Margarita, CA, I wasn't overly thrilled. 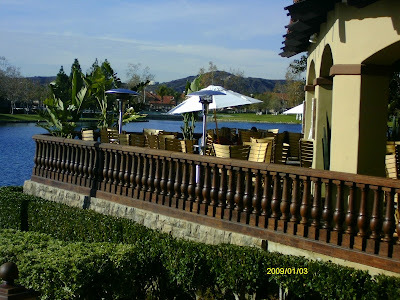 The most exciting part for me was the balcony overlooking the lake! However, once we got seated I was pleasantly surprised. Immediately we were served chips and salsa (not very unusual - though their chips were fantastic and served warm), but also a bowl of vegetarian refried black beans! They were fantastic! My three year old couldn't get enough, and frankly neither could I! After perusing the menu, I found a vegetarian spinach enchiladas verdes, and I was ecstatic to have something other than plain cheese enchiladas. When they arrived I was pleased with the presentation and the surprising garnish of arugula. These enchiladas were delicious! They didn't have a ton of cheese, so I wasn't left feeling heavy afterwards. The arugula added a very nice flavor to the spinach and avocado. Needless to say, there was nothing left over! 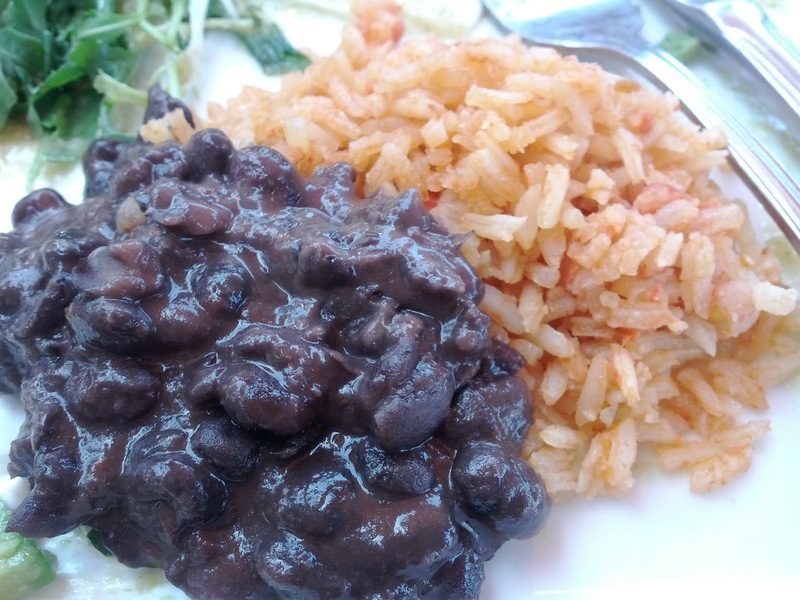 The sides are served family style out of common bowls for the table and the default is refried pinto means, but they will gladly add a bowl of the black beans for the table. I was happy that my daughter had the option of delicious black beans without the added lard. This delicious meal was topped off by a refreshing strawberry-jalapeno margarita. What a great way to enjoy a meal with the family overlooking a beautiful lake on a sunny day. If you happen to be in the Rancho Santa Margarita area of Orange County, I would definitely try this out! My husband had the chicken burrito, but enjoyed it so much, I couldn't even get a picture of it! This week we picked up some old favorites and a few things we have never tried before! We got some cauliflower, cilantro, sweet onion, strawberries, and tangerines. But feeling adventurous, we also picked up some collard greens and pattypan squash - both of which we have never eaten (much less cooked!). So this is what I came up with for the week. What do you think? We will be making a popcorn cauliflower snack and enjoying the strawberries and tangerines for dessert.